The conspiracy lives. It lives in Miami, where they're destroying baseball, just like they did in another city before. It lives in the hands of Jeffrey Loria and David Samson, the owner and president of the Marlins, the con artists who pilfered Miami's money before moving on to its dignity. And it lives especially with Bud Selig, the commissioner of baseball who's letting it all happen again, because he's part and parcel to it. By now, in the fallout of a trade nuclear even by Marlins standards, Samson and Loria have been marked radioactive. To dump $181 million in salary like they did Tuesday – to trade Jose Reyes, Mark Buehrle, Josh Johnson, John Buck and Emilio Bonifacio to Toronto for a few prospects, a bad-attitude shortstop and a backup catcher – was galling even by their standards. And these were two men who for years lied about their finances, lied about their intentions, lied all to get Miami to build them a $634 million ballpark that was supposed to end this wretched cycle of turning a major league franchise into a swap meet. And yet all this time, throughout the lies, the SEC investigation, the embarrassing payrolls, the pocketing of revenue-sharing dollars, the cries from the players' union and the gem of a stadium with all those empty seats, not a word from the commissioner. Not a lamentation that by the time the balloon payments on the stadium hit, Miami taxpayers will owe more than $2.4 billion. Not a sign that he intends to protect the sport from the cretins within. And not a chance, unless public outrage on the matter changes his thinking, that he'll use his best-interests-of-baseball clause to keep Jeffrey Loria and David Samson from murdering another baseball market. This is not some Roswell, black-helicopter, second-shooter conspiracy. This is very real. This is three rich, powerful men getting together and using their influence and business acumen to affect dealings that hurt the sport and help their bank balances. This is an insult to those who care about baseball. And we know this all because this isn't the first time it's happened. "This action is filed by the victims of a conspiracy to eliminate major league baseball in Montreal," begins a lawsuit filed July 16, 2002, by the former owners of the Montreal Expos. Among the defendants: Jeffrey Loria, David Samson and Bud Selig. In the 45-page complaint, the plaintiffs alleged a litany of claims against the three, including that they had broken laws under the Racketeering Influenced and Corrupt Organizations Act (RICO), which the government originally intended for mobsters. Loria, Samson and Selig were just that to Montreal, according to the complaint: They systematically devised plans to kill baseball in the city, all so they could move the franchise and profit accordingly. Selig, the complaint stated, "had secretly determined that major league baseball in Montreal should be eliminated" and went along with Loria's plan to stop televising games and broadcasting them on radio in English. Samson ended complimentary tickets for sponsors. And through a variety of cash calls, on which the minority owners refused to act because they disagreed with the franchise's direction, Loria nearly quadrupled his stake in the franchise, allowing him to pull off the deal that eventually netted him the Marlins. MLB bought the Expos for $120 million and gave Loria a $38.5 million interest-free loan. Loria, in turn, purchased the Marlins for $158.5 million. And the Marlins' owner, John Henry, led a consortium to obtain the Boston Red Sox. It was good-ol'-boys glad-handing at its finest, and the consequences for the Expos were dire. While Loria inherited a Marlins team that would win the 2003 World Series, MLB was sabotaging the Expos worse than the lawsuit imagined. The league sent the Expos to San Juan, Puerto Rico, for 22 "home" games. Nonetheless, they were tied for the wild-card lead on Aug. 28. MLB then refused to allow the Expos any September call-ups, leaving them wildly short-handed compared to their opponents and exacerbating their fade. In November 2004, an arbitration panel ruled in favor of Loria, Samson and Selig, saying the plaintiffs' "sense of betrayal, even if justified, doesn't amount to fraud." That, of course, did nothing to allay their greatest fear coming true six weeks earlier. 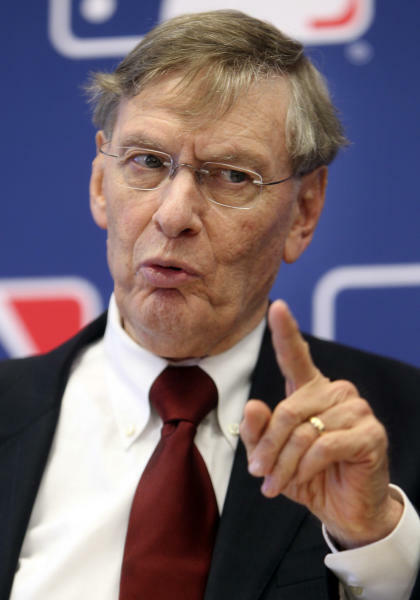 On the final day of the 2004 season, Selig announced the Expos would move to Washington, D.C. The job of a commissioner in professional sports is, ostensibly, to look out for the sport's welfare. In ousting Frank McCourt from owning the Los Angeles Dodgers, the perception was that Selig did just that. McCourt took a proud Dodgers franchise and turned it into a chop shop. Never mind that Selig himself blessed McCourt's ownership; at least he understood that charlatans like McCourt were bad for baseball. The truth is more like this: Selig saw in McCourt someone dangerous and reckless with baseball's most prized possession, local television rights. McCourt was willing to pawn them off for an under-market price to help cover his debts. Selig refused to let the Dodgers set the market low, fought like hell to make sure that didn't happen, won that fight, watched the Dodgers sell for $2.15 billion and is watching them turn into the West Coast Yankees. What he'll never say is that Jeffrey Loria is a far worse owner than Frank McCourt on his divorcingest day. He is the Voltron of awful owners. Like McCourt, Loria didn't have a whole lot of money; he bought his controlling stake in the Expos for $75 million Canadian, around $67 million U.S. at the time. Like Rachel Phelps in "Major League," Loria did everything possible to destroy his franchise in an effort to move it. Like Dan Snyder, he allowed his megalomania to influence personnel decisions. And like nobody else, he hoarded massive checks from MLB while passing along the bill for the stadium to the taxpayers. The Marlins can claim the money comes from tourism-tax dollars. Truth is, Miami-Dade County moved general-use monies from property taxes to free up the tourist cash. This is the dirtiest secret of Selig's two decades as commissioner: The "golden era" of which he so often brags came off the taxpayer's teat. Of the 21 stadiums built since Camden Yards started the boom in 1992, the San Francisco Giants' AT&T Park is the only one privately funded. Baseball's business plan depended on new stadiums with sweetheart deals filling the coffers of ownership groups lucky enough to leverage politicians or voters into signing off on them. Cities signed deal after dreadful deal, few worse than the Marlins', who paid for less than 20 percent of the stadium, received a $35 million interest-free loan to help and used $2.5 million more of public money to fund seizures. Despite Loria and Samson's protestations otherwise, this was always the endgame of their stadium gambit. Selig saw the Marlins' audited finances every year. He knew they were lying. He went along with it anyway. That's how he does business. He protects his friends. It's why Fred Wilpon still owns the Mets. It's why Frank McCourt doesn't own the Dodgers. It's why Jeffrey Loria will again be allowed to skate, even though this trade abandons all pretenses of competitiveness that he and Samson swore were guaranteed upon the construction of a new stadium. They spent last offseason recruiting the best free agents, and among Reyes, Buehrle and Heath Bell, they convinced some of them to join this new era in Miami, with a fresh name, fresh colors, a fresh start. The refusal to include a no-trade clause was organizational policy, not a big, bright warning sign that these swindlers would be franchise-slaughtering recidivists at the first sign of strife. And it came immediately. Fans didn't show up, and whether it was because Loria and Samson's actions throughout the years whittled the base to nothing or the team was awful or a combination, it foretold a messy sell-off. First went Hanley Ramirez. Then Anibal Sanchez. And now the rest of them. "Alright, I'm pissed off!!! Plain & Simple," tweeted one of the leftovers, star outfielder Giancarlo Stanton, and, well, he has every right to be. After opening last season with a $101.6 million payroll, the Marlins owe $19.6 million to their four players past arbitration. The rest are kids. Some with a couple years of service. A few with one season. Most with less than a year. This is not just going young. This is going pre-school. Gone is any chance that Stanton – or anyone who cares about winning, frankly – will commit long-term to the Marlins, which means the payrolls will remain skinflint and the influx of shared money – now topping $100 million annually for the poorest franchises – will make the Marlins all the richer, increase their franchise value beyond the $450 million Forbes estimates. There are players desperate enough for a job, for a paycheck, who will take their money, dirty though it may be. MLB still allows Loria and Samson a roster with 25 spots to fill, after all. How, after 13 years of desecrating two franchises, Loria and Samson continue to exist as owners rests squarely on Selig. He is supposed to be the gatekeeper, the protector, the guardian. And instead, he chooses to be the co-conspirator in the biggest fraud baseball knows. This conspiracy is real. It's very real. And it's embarrassing that it's happening all over.